Registered Psychotherapist, Art therapist M.A., C.C.C. As an art therapist, it is my role to help guide clients in exploring themselves more deeply through the language of art: through line, colour, image, and shape. By using art materials as an additional mode of communication to express the self, I work to meet clients on their journey of learning more about their emotions, experiences, relationships, challenges, and overall sense of identity, and then to offer art as an alternative way of expressing the self – bringing life and insight to what may not be easily articulated in words. 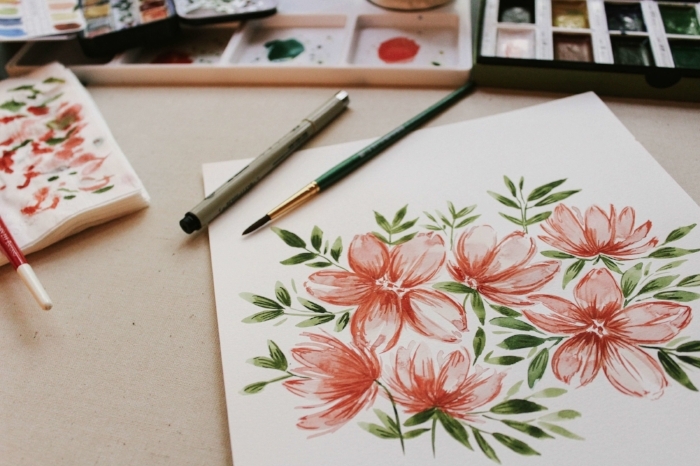 Art therapy combines the creative process and psychotherapy, facilitating self-exploration and understanding. Using imagery, colour and shape as part of this creative therapeutic process, thoughts and feelings can be expressed that would otherwise be difficult to articulate. (Canadian Art Therapy Association, 2017). Making art as a way of nourishing and giving voice to the inner parts of the self is something that I know and believe, and something I have witnessed and personally experienced. But in my work, and more generally in the world, I often hear more of the opposite: claims of not being creative or good enough at art, or a questioning of its purpose. What is it for? What will that do? How will that help? Firstly, one does not have to have any experience or “skill” in artmaking to make art or participate in art therapy. As for why make art, people may know of its obvious benefits, especially considering the adult-colouring craze, but there truly is more. So, why create art for the self? Making art is a practice of mindfulness. When we allow ourselves to get lost in the sensory experience of letting watercolours flow together, scribbling aimlessly, or splattering paint, the rest of the world can fall away, if only for a moment, and we can be present in exactly that moment. It is an opportunity to immerse ourselves in a process that is inherently free and accepting – open to whatever our hands may do. The typically noisy world can become quiet as we focus on our creation, no matter how simple or complex. As Junot Diaz beautifully said: "The whole culture is telling you to hurry, while the art tells you to take your time. Always listen to the art." Art can give visual shape to emotions we experience that otherwise we could not understand. We are often pressured to articulate what and why we feel things, and this can be an overwhelming experience if we don’t have a clue. These confusing emotional experiences can be deciphered through making art. Abstract doodles, scribbles, shapes, and colours put to paper can give us insight into what we are feeling and serve to release what is happening in our body. By expressing emotion through art, we can release what can be all-consuming, and place this outside of ourselves onto the page or canvas. Interestingly, Merriam-Webster dictionary’s first definition of catharsis is: “purification or purgation of the emotions (such as pity and fear) primarily through art.” (Merriam Webster Dictionary, 2018). This creates a sense of separation between our own self and emotions and we can be free to gain new perspective and understanding, which can otherwise be very difficult when we are fully absorbed by what we feel. The process of how we engage with art can give us insight into ourselves, and more broadly in how we approach the world. Does the flurry of scribbles that just landed on the page represent what you feel in your body at this moment? Do the slow swipes of the watercolour brushstrokes reflect your calm, quiet, sense of being? Does our self-critical attitude come forth when we begin to make art, where we find ourselves stuck in negative thought patterns, unable to begin to let go and create? Or perhaps our perfectionist side comes forth, preventing us from making anything unless it is “good enough” for a frame. By making art, we have a record of each of these experiences. We can experience the validation of seeing how we personally feel expressed on the page in a tangible art piece. And even more impactful, the process of artmaking can teach us about who we are, how we feel, and how we engage with the world - what we struggle with, what we embrace, what we hide, what we are afraid of, and what we need. It helps us to understand on a deeper, unconscious level what is happening for us in the here-and-now, bringing awareness to what may be buried, or what cannot be explained using words alone, as our brain, body, and heart is given an alternative way to communicate. It is when we can have these parts of our self reflected back to us through the art, that we can discover new things, provide answers to questions about the inner self, gain awareness, and make change. Yes, just like in other aspects of our lives, the question of being “good enough” can come to the forefront in the creative process. However, it is within this process that we are able to make mistakes and allow accidents to happen without any real ramifications – unless you count accidentally using a red-brown pencil crayon for the colour of a tree trunk when you meant to use a chocolate brown one. Here, in the creative process, we can explore more deeply the feelings of not being good enough or other thought patterns, and practice going against these negative thoughts by pushing through to engage in creating anyways. We can mess up, and practice coping with these feelings that may be similar to when we feel we have made mistakes in other aspects of our lives. The canvas is truly a reflection of how we experience our world, so when we express through art, we have the opportunity to externalize this, and look at it from a new perspective. Art allows us to get in touch with ourselves, and to heal from experiences of the past and present by giving a voice to the inner parts of us that were perhaps previously silenced. Art allows us to engage in something that is non-judgemental, and vulnerable. How is artmaking vulnerable? We are engaging in something that may or may not work out like we envision. In art, there are large margins for error: we have varying levels of control depending on the art materials we choose (i.e. watercolours cannot be painted over with other watercolours, but pencil can be erased). If we choose to share our art with others, there is a chance that they may not accept or like it, and that they may criticize it; or, the critic may be our own self as the artist. Finally, when we are making art, we sometimes have no idea what will come out of us – what will be expressed by our brains, body, and soul. It may share welcome ideas/thoughts/emotions, or ones we didn’t expect, that we may not be ready to acknowledge. Making art is the perfect neutral ground within which to lean into vulnerability, because there is no right or wrong, no standard to uphold. This process serves as practice, a metaphor for how we experience vulnerability in other aspects of life. When we practice vulnerability by taking chances and feeling all the potential emotions of pride, disappointment, success, and fulfillment in our creative life, then we will soon engage in this vulnerability in our relationships with others, embracing it as we deepen our sense of self. For many, a confining challenge is the idea of not knowing where to start. How does one create art for the self? Like many things, the first step begins with a bit of a fight, movement against the grain … against our usual patterns that are fueled by the messages that we have heard throughout childhood, adolescence, and into adulthood. Combat the little voices inside of your head that say “You aren’t creative,” “You can’t make anything good or worthy of sharing with others,” or “You don’t have any art materials.” For when we are making art for the self, we are doing exactly that. Not making art to please or impress someone else, not making art with the intent of creating a masterpiece that will be framed for the wall and all to see. We are making art simply, to make – no justification required, except what we feel is important. When we shift this intention, that we have to justify our actions or create something for anyone but ourselves, when we give ourselves the permission to be freed from the judgemental voices inside our heads, creative magic can truly happen. That is what I would suggest is the first step – simply begin by giving yourself permission to create. You may have some free, unscheduled time just for yourself. All it takes is a pencil and paper, or perhaps dig out the coloured pens that you don’t use in your day-to-day tasks. They can have a place here in your artmaking time. Doodle: don’t start with a plan, simply let yourself play, draw big or small, lines, shapes, or squiggles. Don’t make it perfect, tell yourself it is a draft, a scrap piece of paper to see what the colours look like if you need to. Do something with those images that you have been collecting from magazines or do a google search of what you love and print these out to collage together. If you extend this process of play and experimenting to other materials, like watercolours, oil pastels (which are now available at the dollar store… they have really upped their game! ), or acrylic paints, you will find that you develop new preferences for materials, new ways of working, a pattern in your creative ways, which is your own unique style coming through. Follow what feels good, fun, or satisfying, follow your instincts in what you are drawn to. This is you following yourself, trusting your inner knowing, and giving yourself the time and space to allow this to flow out of you onto paper and canvas. This process itself is much bigger than the art you actually create – it is you fueling your trust in yourself, your inner resources, your confidence in that what you have to offer is worthy. Even further, in this creative space, allow yourself to be vulnerable, to make mistakes, to smudge up the details, mix the completely wrong colour, and “colour outside of the lines,” as the saying goes. Here, in this creative space, you do not have to answer to anyone, or uphold a standard, because the creative process is inherently imperfect, but good enough – one of accidents, revisions, and repeats. Even the greatest artists/creatives in history, whom very narrowly define the process of making art for many people (i.e. why make art if it’s not going to go in a gallery or be any good), engage imperfectly in making. In this way, the creative process is wholeheartedly accepting, as each of these accidents is recorded in the creative work, not to remind us of where we may have “messed up,” but to authentically make note of exactly who we are, without apology, and that this is okay. Surmount the hurdles of judgement and perfection, embrace the acceptance of the creative art process, and it is then that we can be open to what may come forth, what our own creations, doodles, drawings, can teach us about ourselves. We can develop a trust in ourselves, that says “I have no idea what I’m drawing, or what I’m painting, but I’m just going to keep going.” These are the moments of true acceptance of the self. These extend beyond making art and run deeper in impacting our overall perception of our self. So, as a creative manifesto of sorts, here are the steps to embark upon creating art simply for yourself. Pick up that tiny, cheap sketchbook, unpack those freshly sharpened pencil crayons, and allow yourself the freedom to unload, express, and nurture all the parts of your self. These are some of the ways that creative artmaking surpasses the singular notion of making something, and how being creative is a process of nourishing the self. 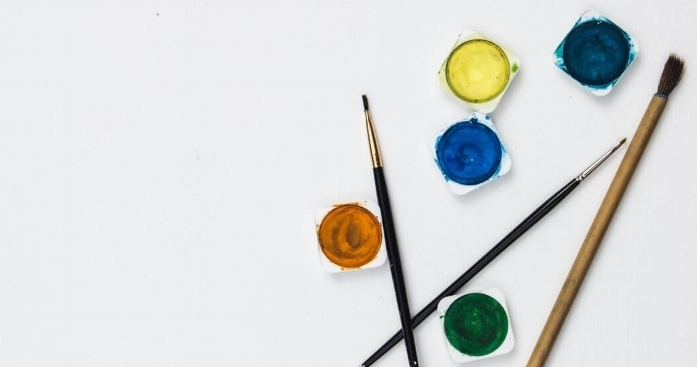 As an art therapist, I have the pleasure of witnessing each of these powerful facets of creative expression and the incredible growth that follows in clients that I work with. The art therapist joins alongside clients in their creative journey, as a guide, explorer, new perspective, and trusted ally. Together with clients, the therapist reflects observations, wonders along with them, and invites them to explore more deeply the relationship with the self, others, and the world. With the addition of the trusting therapeutic relationship, vulnerable emotions can be experienced and explored together; new insights can be uncovered, leading to growth, change, and acceptance of the true self. Jazmine Tufford-Singh, a registered psychotherapist and art therapist, works with individuals and groups of all ages in art therapy & psychotherapy in her private practice in Kitchener, Ontario. She also creates and facilitates workshops for children, students, teachers, parents, families, adults, and artists, always with a goal of creating a safe space for the expression, validation, and honouring of the true self. For more information about her individual therapy work, group workshops, and how to get in touch, visit her website at www.jtsarttherapy.com.